E-VideoMeetings - using the latest technology hor holding on-line, Audio & Video meetings, along with Application Sharing for 3 to 10 people. It's almost like "being there" in-person, but at a fraction of that cost. E-VideoMeetings provides high quality, interactive audio and video among participants, as well application sharing for various kinds of documents. Save time and travel costs! 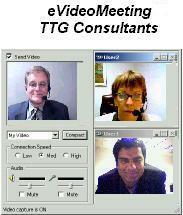 E-VideoMeetings can be streamed from TTG's offices to multiple training/conferencing sites simultaneously. All parties see and hear each other, so the experience is very close to an in-person meeting. E-VideoMeetings can be any length, on virtually any subject.